The second-day criminal trial of former prime minister Najib Abdul Razak involving SRC International Sdn Bhd is scheduled to start at the Kuala Lumpur High Court at 9am today. Najib is facing a trial into three counts of criminal breach of trust (CBT) and one count of abuse of his position over funds amounting to RM42 million linked to SRC International, a former 1MDB subsidiary. The 65-year-old politician, who was also the finance minister and adviser emeritus of SRC International, is also facing three money-laundering charges over the RM42 million. The three CBT charges are laid under Section 409 of the Penal Code, the abuse of position charge is under Section 23 of the Malaysian Anti-Corruption Commission (MACC) Act 2009, and the three money-laundering counts are per Section 4 (1) (b) of the Anti-Money Laundering, Anti-Terrorism Financing and Proceeds of Unlawful Activities Act (AMLATFA) 2001. If convicted, the Pekan MP can be sentenced up to 20 years in jail, whipping and fine for the CBT charges; maximum 20 years in jail and a fine not less than five times the amount of bribe involved or RM10,000, whichever is higher, for the abuse of position charge; and jail time not exceeding 15 years, and a fine up to RM15 million or five times the amount involved, whichever is higher, for the money laundering charges. His case today will be presided by High Court judge Mohd Nazlan Mohd Ghazali, with the trial to kick off this morning with the resumption of Najib’s defence team cross-examination of the first prosecution witness, a deputy registrar at the Registrar of Companies Malaysia. The witness is Muhamad Akmaludin Abdullah, 35, whose task in the statutory body included providing information on companies and businesses to the public and government agencies. Back on the first day of Najib’s trial on April 3, Mohd Akmaludin testified that he had received a request from the Malaysian Anti-Corruption Commission (MACC) to run checks on records of three companies, namely SRC International, Gandingan Mentari and Ihsan Perdana. Today, Attorney-General Tommy Thomas is expected to lead the 13-person prosecution team, comprised of DPPs Sulaiman Abdullah, V Sithambaram, Manoj Kurup, Ishak Mohd Yusoff, Donald Joseph Franklin, Suhaimi Ibrahim, Muhammad Saifuddin Hashim Musaimi, Sulaiman Kho Kheng Fuei, Budiman Lutfi Mohamed, Mohd Ashraf Adrin Kamaril, Muhammad Izzat Fauzan, and Mohd Ashraf Adrin Kamaril. Meanwhile, Najib will be represented by a 13-person defence team led by veteran criminal lawyer Muhammad Shafee Abdullah. 9.13am – Najib puts away his book and enters the dock as High Court judge Mohd Nazlan enters the courtroom to begin proceedings. 9.03am – Clad in a black jacket, Najib Abdul Razak enters the courtroom and sits at the front row of the public gallery. He is seen reading a book as he awaits the beginning of proceedings. 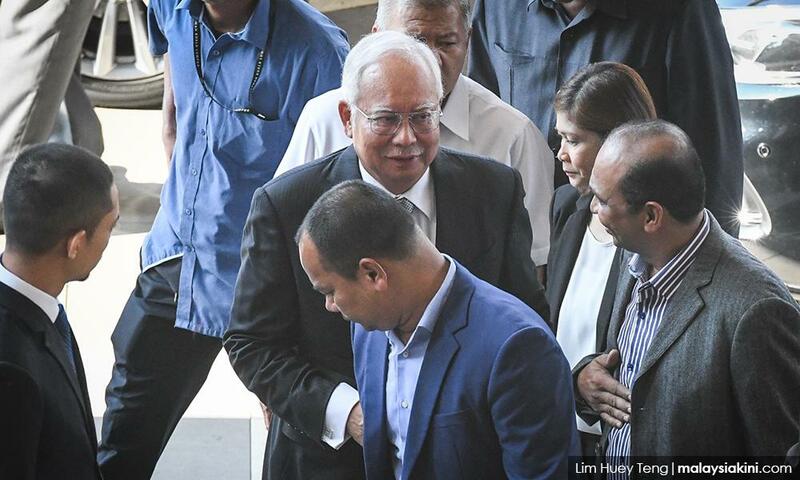 9.01am – Najib Abdul Razak arrives at the KL High Court in a black Proton Perdana. The cheery-looking ex-premier greets the reporters stationed outside as he enters the court complex. 8.52am – Attorney-general Tommy Thomas enters the KL High Court Criminal 3 to lead the prosecution team in today’s SRC International trial against Najib.